Preheat oven to 350oF. Spray 13- by 9- by 2-inch baking pan with vegetable oil spray; set aside. In large bowl, whisk together flour, sugar, cocoa, baking powder and salt. Whisk in remaining cake ingredients, blending thoroughly. Pour into baking pan, spreading evenly. In large bowl, whisk together pudding ingredients until sugar and cocoa are dissolved. Let cake rest 15 minutes before cutting. 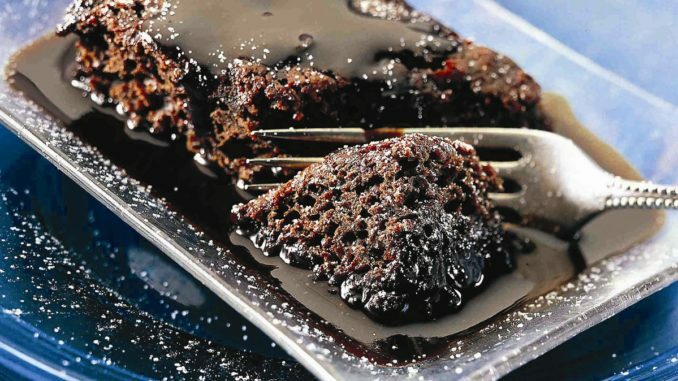 To serve, slice cake and top with sauce, or pool sauce on plate and top with cake. Cover and refrigerate leftovers up to 7 days or wrap tightly and freeze up to 2 months. This recipe is reprinted with permission from the “American Heart Association Meals in Minutes Cookbook,” Copyright (c) 2002 by the American Heart Association. Published by Clarkson Potter/Publishers, a division of Random House, Inc. Available from booksellers everywhere.